The beautiful color of a gemstone is its most defining characteristic; many jewelers consider it to be the most important evaluation criterion. When deciding upon gemstone color, examine hue, tone and saturation. The most valuable gemstones are those that exhibit a pure color and only "slight" hues of other colors in addition to their primary color, as all gemstones do. For example, sapphires range in hue from "slightly purplish-blue" to "slightly greenish-blue," pink sapphires always range from "pink" to "slightly purplish-pink," and rubies range from "slightly orangish-red" to "slightly purplish-red". With the exception of opals, variation in a gemstone's hue will be called out in the gemstone details on the product detail page. Tone represents the depth of color, ranging from colorless to black. Gemstone tone is described as "light," "medium-light," "medium," "medium-dark" and "dark." O'Hallorans Jewelers offers gemstones with the most sought-after tones that fall within the medium-light to medium-dark range. For all of our gemstone jewelry, you'll find any tone variations are called out in the gemstone details. Saturation, or color purity, refers to the degree to which the gem is free from brown or gray hues. The most desirable gemstones, which show little gray or brown, are often described as having "vivid" or "strong" color saturation. Generally, the levels of color saturation will not be called out in the product details because the gemstones in our jewelry are hand-selected for their vivid colors. Because gemstones form under unique circumstances, each individual gemstone is comprised of a combination of trace minerals, which create a unique set of identifying marks or inclusions. Inclusions will not necessarily detract from the beauty or desirability of a colored gemstone. When considering a colored gemstone's clarity, you should measure your expectations against the standard for that variety of gemstone. Some varieties of colored gemstones, such as aquamarine, blue topaz and citrine, have naturally fewer inclusions while other gemstones, such as emerald and ruby, tend to have a higher rate of acceptable inclusions. 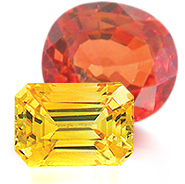 Clarity is an important factor in comparing quality colored gemstones. Even opaque opals can have milky inclusions, which will affect their iridescence and color play. In general, the best values are available in gemstones that are moderately included. Exceptional gemstones with few or no inclusions are available, but they can command extravagant prices. While gemstones are durable, they require varying levels of care. For example, some gemstones are especially vulnerable to household chemicals and temperature changes. Cleaning gemstones can present special challenges. Many gemstones can be cared for by following our basic care guidelines below. Please refer to our Gemstone and Pearl Care and Enhancement Overview to understand the care requirements for your specific stone. After removing your gemstone jewelry, clean it by following the directions on a non-abrasive jewelry cleaner. Make sure the jewelry cleaner is safe to use with your gemstone. Use a soft cloth to remove any remaining dirt or other residue. Store your gemstone jewelry in a lined case or a soft cloth, so that the gems do not touch each other or parts of other jewelry. Gemstones are harder than gold, silver or platinum and can scratch the surfaces of your other fine jewelry if they are not kept separate. While it's true that gemstones such as ruby and sapphire are second only to diamond on the hardness scale, it is not a measurement of their indestructibility. It means that these gemstones are able to resist scratching almost as well as a diamond. Abrasive surfaces, harsh chemicals, and sharp blows can damage even the hardest gem. Your gemstone jewelry should be the last thing you put on when getting dressed and the first thing you take off at the end of the night. Store your gemstones carefully and they will be enjoyed for generations.